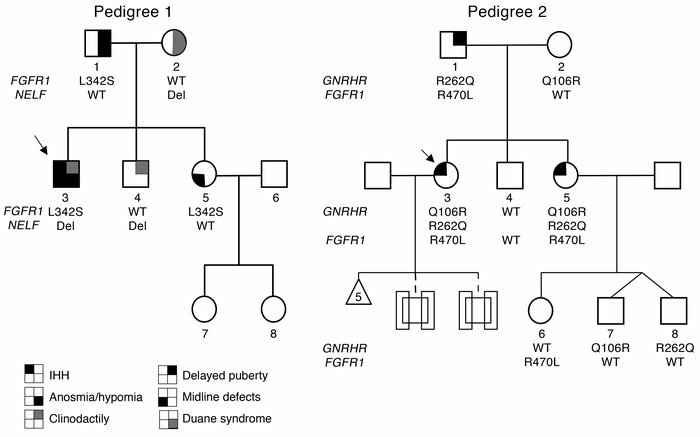 Identification of FGFR1 (p.L342S) and NELF (8-bp intronic deletion) mutations in pedigree 1; identification of GNRHR [p.Q106R] and [p.R262Q] and FGFR1 (p.R470L) mutations in pedigree 2. Only subjects harboring 2 gene defects have IHH. Probands are identified by arrows; circles denote females, squares denote males. Del, NELF intronic deletion.